Mr. Billström! Mitra Stays… and the Islamic Regime Goes! Mitra Kahrom is a political activist. She is associated with an anti-Islamic regime nationalist organization. Mitra is a constant guest-speaker in that organization’s internet-based TV program which airs towards the Islamic regime. Opposition TV channels are widely watched in Iran and are considered by the Islamic regime as a serious existential threat. Streets of major Iranian cities and indeed people’s rooftops are frequently occupied by Islamic Republic special commando forces who, by invading peoples’ practically non-existent privacy, humiliate and insult them while confiscating or destroying satellite dishes. Iran Focus Tehran, Jun. 11 - Satellite television broadcasts have failed to show in Tehran since Wednesday afternoon. Virtually all broadcasters have been affected, including the Persian service of US-based Voice of America television and the dissident Simay-e Azadi (iranntv.com). When those channels are dialled only a blank screen appears. Authorities have dramatically increased police patrols and searches in the capital on the anniversary of anti-government protests last summer. Men and women who walk together must carry documents proving they are closely related. 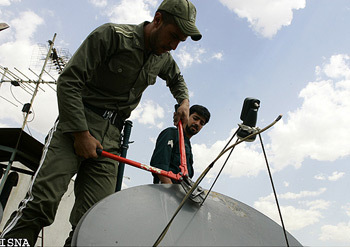 State Security Force agents routinely go up rooftops in Tehran and other major cities removing satellite dishes which are banned in Islamic Iran. The Islamic Republic banned satellite dishes in 1995. The crackdown has been prompted by broadcasts from Iranian opposition groups whose television programs reportedly have a large audience in Iran. Last November, the semi-official news agency ISNA quoted, Ali Darabi, Deputy Director of the State-run TV and Radio as saying, "40 percent of Iranians are now tuning in to watch satellite TV channels… The rate of satellite viewership in this society is extremely troubling". Darabi accused media outlets such as Simay-e Azadi of penetrating Iranian households and causing "family break ups". Opposition TV channels are closely watched, and the political and propaganda directions closely monitored. In this clip, Mitra responds to a regime agent who called to criticise and attempt to humiliate Mitra after Mitra called for uprising and overthrow of the Islamic regime. He called to bad-mouth Mitra and the TV channel. Mitra responds here by asserting the fact that the overthrow of Islamic regime is the duty of all Iranians irrespective of gender, ethnicity and ideological orientation. Despite Mitra’s extensive and publicly broadcast opposition activities against the Islamic Republic regime, the Swedish government intends to break international law and send Mitra back to Iran. Please support Mitra by signing the petition calling for her deportaiton to be canceled and her refugee status recognized. Mitra Kahrom is a political activist. Deportation av Mitra and other political activist to Isalmic Regim of Iran is against the Declaration of Human Rights.